iMacsoft iPhone Video Converter is powerful yet easy to use iPhone converter software especially designed for Windows users to convert all popular video to iPhone video formats, such as convert to iPhone movies from WMV, RM, RMVB, MOV, DAT, VOB, MPEG, FLV, AVI, DivX, XviD, etc. to iPhone video MP4, widescreen iPhone video MP4, iPhone video H.264/MPEG-4 AVC for playback on iPhone 3, iPhone 4, iPhone 5, iPhone 5S/5C, iPhone 6/6 Plus. The iPhone Converter is also an iPhone Audio Converter, which can convert any audio formats, such as WMA, MP2, OGG, RA, AC3, CDA, etc. to MP3, M4A, AAC, WAV for playback on iPhone 3, iPhone 4, iPhone 5, iPhone 5S/5C, iPhone 6/6 Plus, iPod, iPad, iPad 2, the new iPad, iPad mini, iPad 4 and Apple TV. 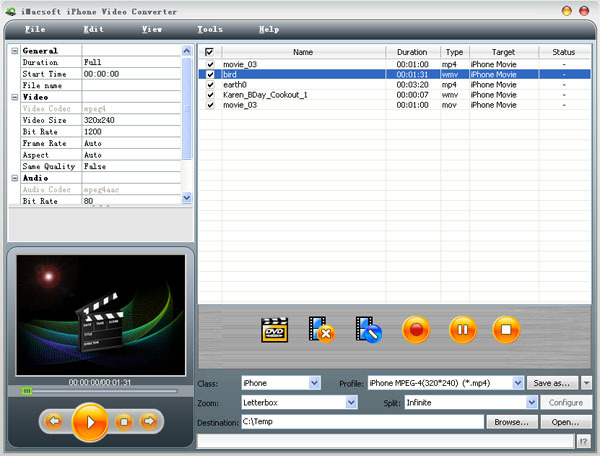 iMacsoft iPhone Video Converter has strong function of editing options, such as movie trimming, video and audio encoder settings, batch conversion and so on. The conversion will be finished in a few clicks, then you can put the converted video files onto your iPhone for you to enjoy anywhere and anytime. Now free download and try this powerful iMacsoft iPhone Video Converter software and colorize your digital entertainment life. How to convert video to iPhone 3G? How to convert video to H.264 that can be played well on your iPhone? How to convert AVI video to iPhone? How to convert WMV to iPhone MP4 video files? How to rip MP3 audio from video that can be playable on your iPhone 4G?